The weather is again proving unpredictable here in Ontario. Frost expected tonight, (last day of May) and we have our fireplace going today, because my husband saw a sprinkling of hail. He is addicted to a woodstove and any excuse will do. Just can't give up that "deep-sleepy-mode" type of winter heat. Though it is I admit, quite comforting on an overcast day, it was difficult to stay awake chopping the bit of rhubarb I have finally been able to get from my garden. I have all Canadian Red, and it's truly quite a gorgeous variety. Anyway, took as much as I could for now, gave the garden a big cup of coffee from the watered down grounds I keep, and hopefully there will be more to get in a few weeks. 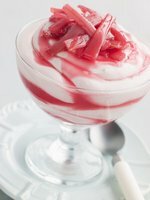 In anticipation of warmer temperatures soon, featured are some "cool you off" rhubarb recipes. Tesco is the biggest retailer of beer in the UK, and has given many smaller breweries the opportunity to expand distribution. Tesco holds an Annual Summer and Autumn Beer Challenge to all UK breweries. Beers are sampled blind by experienced beer judges, with the winners earning distribution throughout the Tesco chain. Ruddles Rhubarb Ale was a one time "Best Beer" and one judge was quoted as saying he was surprised at how much he enjoyed it. It is known as more of a subtle summer beer with a bitter-sweet twist and a "blast of vanilla." It apparently goes very well with old cheddar cheese and an assortment of sweet desserts. Do you get Ruddles Ale from England where you live? We have it here, but will have to check on whether or not the Rhubarb-flavored is included. Place rhubarb, sugar, water, salt, and orange zest in a saucepan. Bring to a boil over high heat. Reduce heat to low. Cover and simmer for 5 minutes. Let cool 10 minutes. Puree in a blender or food processor until smooth. Press through a fine mesh strainer into a large bowl to remove the pulp. Stir in corn syrup. You can dispose of the pulp. This can take several hours or overnight. Process in your ice cream maker according to the manufacturer's instructions. 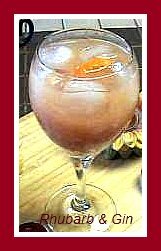 The sorbet will be soft and creamy! Put in a container and freeze. 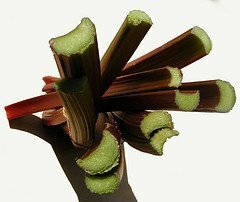 Bring rhubarb, cold water, sugar, and ginger to a simmer in a 4 or 5 quart pot over medium heat. Stir once or twice, then simmer 1 minute. Remove from heat and let it steep uncovered for 1 hour. Pour mixture through a fine-mesh sieve into a large bowl. Stir gently, but do not press hard on the solids. Throw away the solids. This makes 6 cups of syrup. Chill syrup well. Serve in glasses over ice with a splash of sparkling water, club soda or even gin! A high school student Yang (Linda) Liu has won a national award for her research into the potential beneficial effects of rhubarb in preventing Alzheimer's Disease. Linda is a Grade 12 student at Sands Secondary, and was one of 489 students competing in the National Science Fair in Winnipeg. She won one of eight $500 Manning Innovation Achievement Awards. Four projects will be chosen from the eight for a $4,000 award. Her research focused on the effects of rhubarb extract on a specific protein suspected of causing brain cell damage seen in Alzheimer's patients. When certain molecules are not properly shaped, the proteins clump together and brain cells lose their structure and function. Ms. Liu discovered that rhubarb extract possesses the ability to inhibit the clumping of the protein. I continue to be amazed at the possible capabilities of rhubarb. Wouldn't it be something if rhubarb had a significant hand in the treatment of Alzheimer's? I have put up a number of Rhubarb Festival Listings lately that are coming up soon, and for some very worthy causes too. 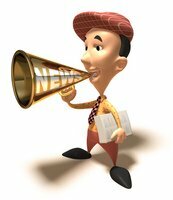 Check them out on the site if you haven't lately to see if something is coming to your area. Would love to hear from you if you have attended one. You don’t need an ice cream maker for this. Wash the rhubarb, and cut it into pieces about one inch long. Put rhubarb, sugar and water in a saucepan, and bring to a boil. Simmer until the rhubarb is very tender. Push rhubarb and liquid through a sieve placed over a large bowl. Discard parts that will not go through the sieve. 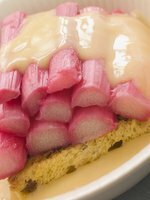 You should have about 4 cups of rhubarb puree. Let cool. Pour into trays or long flat plastic containers and partially freeze. Meanwhile, beat the egg whites until soft peaks form, whip the cream, and chill a large bowl. When the puree is firmly frozen on the edges but still soft in the center, put it in the cold bowl and quickly beat it thoroughly. Fold in the egg whites and whipped cream. Return the mixture to the freezer, and freeze until firm. The red stalks of spring, go and seize ‘em. For this urging, I’ll give you good reason. Unless you wash, cut ‘em and freeze ‘em! Thankyou "Dennis" for contributing the limerick!